Remember All Those Who Voted For ObamaCare? Notice how many of them are no longer in Congress? And We the People still hate it, more now than before it was passed. It’s time for Republicans and those Democrats who like their cushy perks of Office to abort ObamaCare. Posted in economics, Elections, Health, Health Care, history, Law, Obama, politics, Socialists, society, Tax | Tagged: ObamaCare, Ray Stevens | Comments Off on Remember All Those Who Voted For ObamaCare? A reminder that big business and the free market are not the same thing, as we see the Lords of Crony Capitalism collaborate with Welfare State Diktat, and declare it “Good”. “Insurers and the government have developed a symbiotic relationship, nurtured by tens of billions of dollars that flow from the federal Treasury to insurers each year,” said Michael F. Cannon, director of health policy studies at the libertarian Cato Institute. From Facebook comes this gem. See how many squish Republicans are there. I saw a couple of very noteworthy Republicans in that list. And people wonder why the grass-roots are up in arms against Republicans, too. If you are a multi-national corporation headquartered in X country, you pay that country’s corporate tax for the business you do there and you pay the corporate tax in each other country for the business you do there with the exception of one industrialized country. If you are headquartered in the industrialized world’s highest corporate tax country, not only do you pay that country’s highest in the industrialized world for the business you do there but you also pay that country’s highest in the industrialized world for business you do anywhere else. You do get a tax credit for paying taxes elsewhere, but you also still pay taxes in that country for business you do in other countries. Now, why would any fiscally responsible corporation spend more than double its by-nation required corporate taxes if it could just as easily cut it down to the actual rate of said country? If Canada has a 15 percent corporate tax rate (it does), then why would a corporation pay the offending country’s 35 percent corporate tax on business done in Canada, just because the business is headquartered in that offending country? It makes no fiscal sense whatsoever. Especially when it is possible to work the laws to divest yourself of insane tax requirements for doing business elsewhere in the world. Burger King’s majority owner, the Brazilian private-equity firm 3G Capital, would hold the majority of shares in the combined company, their statement said. These Brazilians need to get patriotic and pay their absurdly high American tax rates. See, Burger King’s majority owner, a Brazilian company, did what it took to get out of the outrageously high taxes the US put on it. That’s right. The United States has the industrialized world’s highest corporate tax, and is also the only nation in the industrialized world to force its outrageous taxes on business done in other countries. Never mind Michelle Obama will never allow Burger King to sell its product in American schools, and would rather Burger King ceased to exist, the Loony Left are all up in arms about a business deciding it’s not a good idea to overpay their taxes. The good news is for TBD’s readers. The bad news is for me. The good news is I’ve been able to write more involved articles to the benefit of the readers here. It’s something that I actually desire to do and enjoy doing, but it’s because of the bad news that this good news has occurred. The past Thursday, Friday, Saturday, I was in Salt Lake City, spending over 3000 dollars fixing and maintaining my truck. When I only had a 2100 dollar maintenance account (fed continually from revenue from each of my trips). Then my student and I went to Idaho to pick up a load, travelled to a suburban area of Chicago, then off toward the Los Angeles megaplex. But on the way there, the truck died in Frisco, CO. Coolant decided to go into a white steam-smoke and also into the oil. The cost of that? Besides spending Thursday, Friday, Saturday, Sunday, Monday morning in a hotel in Denver, where hotels are booked (vacation plus legal marijuana) at about 100 dollars a night, there’s the 8000 dollar repair bill. While my maintenance account is completely depleted. I suspect it will take about 6 months to recover. It would be faster, but from 15 August to 10 September, I’ll be vacationing overseas (travel and lodging already paid for), so my revenue will be seriously affected. Again, good news in that my readers get more than the “reblog” type articles. Bad news in that in a period of 1 week, I have incurred over 11,000 dollars in maintenance costs plus lodging costs, with next to no revenue to show for it. And if my truck sits still for 1 week, I still have 800 dollars in expenses. Should I Move From California To Plano, Texas? That is a question someone used in a web search to find an article I wrote some time back: Moving From California To Texas? The person doing the search is likely a Toyota employee. The First Street Journal covered this breaking news quite well, and included multiple links to multiple articles written concerning the ongoing fiscal insanity that is everpresent and effervescent in Leftist state governments, contrasting with the growth-minded nature of Texas. If you’re a Leftist voter, loving yourself some Leftism, stay in that shithole state you helped create. Don’t move to Texas, because you’ll only work to turn a successful state into the shithole state you fled. If you’re a Conservative voter, by all means, move to Texas and flee that shithole state the Leftist parasites created. 70,000 a year income will let you live a better life than 100,000 a year in the People’s Republic of Kalifornia. Texas’ Castle Doctrine will keep you safer. Jobs are more plentiful. But be ready for culture shock. Texans don’t like Big Brother/Nanny State. A dark cloud follows him wherever he goes. Farmers obviously need rain for their crops, so there are some who resort to cloud seeding, adding silver iodide to the clouds to try to force rain out of them. But it’s a bad idea to seed a thunderstorm cloud. 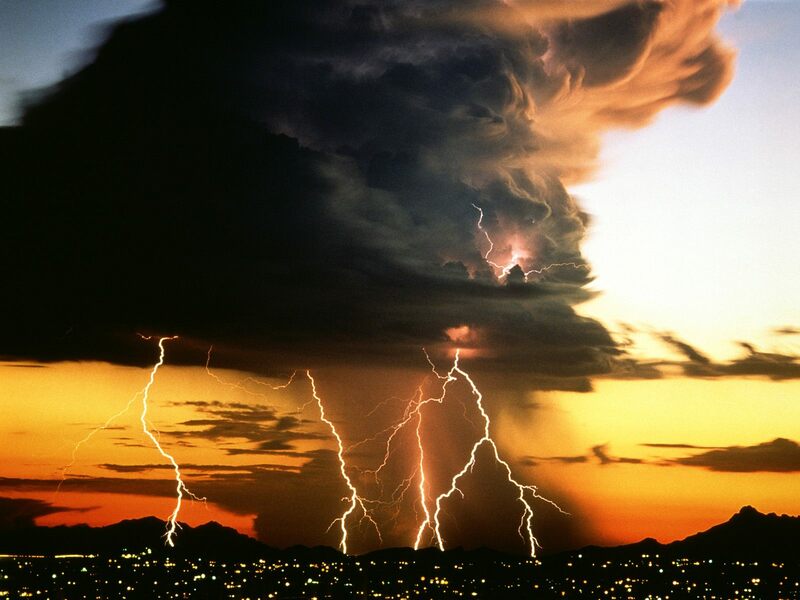 Cumulonimbus clouds can produce nasty things like hail storms, massive lightning storms, micro-bursts, tornadoes. And of course, there are those who always bring bad luck with them, like Bad Luck Schleprock, our current President. Set up a Socialist system with all the false positives front-loaded and all the negatives back-loaded. Get possibly voted out of office before the negatives hit, so the Socialist-caused negatives would hit when Conservatives were in office. Blame the Conservatives in office for the economic disaster the Socialists caused. Get the Socialists re-elected to complete the evil transformation of the Free Market US into a Socialist state, with the Conservatives forever blemished by the results of Socialist actions. ObamaCare is one such program. As most of it is set to kick in now that the election is over, total disaster is on the horizon. Businesses, who cannot pay the cost of ObamaCare and stay afloat at the same time, will be laying off massive numbers of workers nationwide. Other businesses will be cutting their low-level employees (the working poor) to under 30 hours a week so those businesses can stay in business. Very little expansion will be happening, if any at all. It’ll be full-on contraction. A nice little poisonberry in ObamaCare — that “make health care cheaper for all” lie — is a 2.3 percent excise tax on all medical devices, such as crutches, wheelchairs, heart stents, etc, etc. And an excise tax is far worse than a profit tax or income tax. It hits the gross revenue and not the after-expenses cost. For example, suppose it costs a business 5,000 dollars for the raw materials to make a single product. Add in the labor costs, the health insurance costs, the retirement costs, the social security tax, the medicare tax, the property tax for the building itself, the electricity cost, the property insurance cost, the transportation cost, the bookkeeping cost, and all other costs associated with getting the already developed product to market and the final cost to the business is 6,800 dollars. The business sells the product for 7,000 dollars because that’s what the market will bear. The business gets a profit of 200 dollars per sale. In comes the 2.3 percent excise tax. Another 161 dollars off the top. The new profit for the 7,000 dollar item falls from 200 dollars to a whopping 39 dollars (an effective tax rate of 80.5 percent of the profit). Not enough to make the company a going concern. Kill the Research and Development department of the company — the life-blood of all businesses that want to survive, for if a business is not growing and moving forward it is necessarily dying. But it doesn’t stop there. No, not at all. That same company also has to pay the new, higher costs involved in providing ObamaCare to all its employees (instead of the less expensive insurance plans which were optional, which fair portions of employees did not opt into). That 39 dollars per product, which used to be 200 dollars per product goes negative. It costs more to produce than it can be sold for. But, again, it doesn’t stop there. Obama’s declaration that electricity costs must necessarily skyrocket and he’ll bankrupt coal-fired electric plants necessarily means the energy-intensive manufacturing industry will get hit hard with skyrocketing overhead costs. Costs that cannot be reduced merely by laying people off. So instead, the companies will shutter its doors and either go off-shore or cease to exist, providing a double-whammy of forcing the products to become far more expensive than they are now and far more difficult to obtain. Small businesses will collapse. The middle class will become working poor. The working poor will become the unemployable destitute. Products the middle class used to be able to afford will become luxury items. Items that were luxuries for the working poor will become nothing but unreachable pipe-dreams. Inflation will go into hyper-drive. Interest rates will climb, making the cost of borrowing prohibitive. And deficit spending, which has been kept artificially low (yeah, I said it), will explode. How is 1.2 trillion dollars (or more) in deficit spending “artificially low”? That’s a good question. And I have a good answer for that. Two words: “debt” and “service”. Debt service. Historical view of the Prime Rate from Forecast Chart.com (8 percent line added). 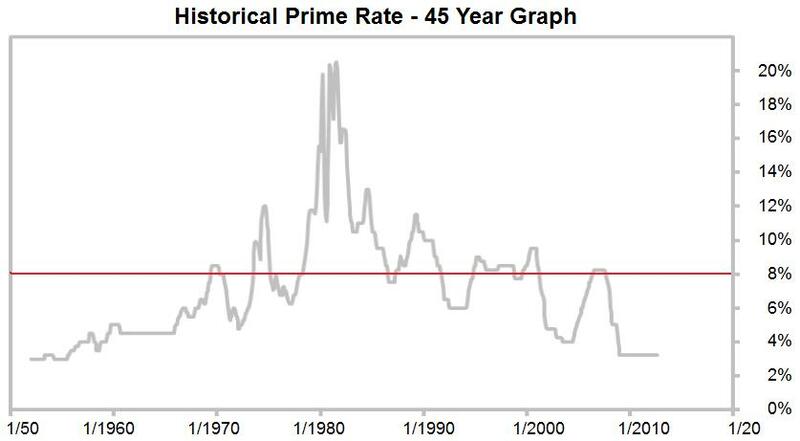 Above is a chart showing the historic levels for the Prime Rate, from Forecast Chart.com. I added a red line at 8 percent for reference. Below is a chart showing the historic levels for the Discount Rate, from a 2009 article on Apin Talisayon’s Weblog (data obtained from the Financial Forecast Center). I added a red line at 6 percent for reference. 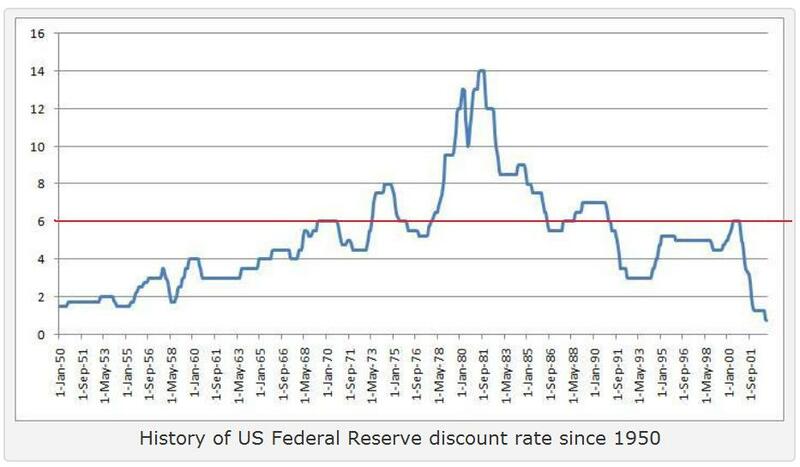 US Discount Rate From 1950 as found on Apin Talisayon’s Weblog (6 percent red line added). As you can see in the above two charts, the Prime Rate and the Discount Rate differ in levels, but mirror each other. And they’re not only at historic lows; they’re far below historic norms. That means the future necessarily will provide much higher rates on borrowing than today. And the Federal Government’s debt service costs absolutely must skyrocket. Couple that with the US credit rating crumbling — and will continue to crumble — and the interest on the debt will become astronomical. Even a fairly normal rate of 6 percent with our current 16,000,000,000,000 dollar deficit means 960 BILLION DOLLARS in interest payments alone. By 2015, our national debt will be 20 TRILLION DOLLARS and the interest on that debt will be 1.2 TRILLION DOLLARS. That’s before paying for roads, bridges, high speed trains to nowhere, free birth control pills for Sandra Fluck (phonetic spelling), free abortion pills for Sandra Fluck (phonetic spelling), free ObamaPhones, free health care, free foodstamps, free college tuition, free housing for the poor and forever pregnant single mothers, free Big Bird, free NPR propaganda, bailing out California, Illinois, Maryland, New York, free cowboy poetry, and oh yeah, paying for our national defense. 1.2 TRILLION DOLLARS SPENT TO PAY FOR ALREADY SPENT MONEY WE DIDN’T HAVE BEFORE PAYING FOR ANY CURRENT PROGRAMS AND EXPENSES!!! The Socialist who ascended the throne in DC, along with the Socialists in the US Senate who have adamantly refused to produce a Federal Budget since April, 2009, in direct violation of Federal Law and the US Constitution, have successfully Cloward-Pivened the most prosperous nation in the history of the world. The most prosperous nation this world has ever seen has been successfully brought to financial ruin by the Leftists in power who have no use for a document that is “over 100 years old”. The aim? Destroy the Free Market and implement Socialism worldwide. Gee, why do you think the Obama administration waited until after November 6th to mail these letters?